To proceed to the tour buses, get out of the Schottentor U2 subway station (represented by "Universitatring 14" in the above map) and walk along the dotted line to the street that separates the green lawn around city hall ("Rathausplatz" means "city hall square") from the University of Vienna. The tour buses will be parked around the red balloon on Rathausplatz as seen in the above map. The Sunday bus tour to the Khalenberg Mountain departs at 13:30. Bring a comfortable pair of walking shoes for this event. The two buses for the Tuesday tour depart at 8:30 AM and 8:45 AM respectively. For Wednesday, the departure is at 9:30 AM for both buses. Despite all this sounding quite simple and straightforward, there are three potenital points of confusion. First, do not confuse the Schottentor U2 station (click here to see its location on the purple line) with the Schottenring U2 station (one stop too far away - click here to see this WRONG station at the point where the green and purple lines intersect). Second, the Rathausplatz street is bifurcated around two sides of the square; you want the side that is closest to the University of Vienna. In the photo below, the tour buses will be waiting along the lower part of the dotted line, in Rathausplatz. Third, while our tours depart from the University of Vienna (Universitat Wien), our conference presentations will be at a different university in Vienna, the FHWien University of Applied Sciences of VKW. Hence do not confuse FHWien University (our conference location) with the University of Vienna (from where our tours will depart). The FHWien of Applied Sciences of WKW is across from the Wahringer Strasse-Volksoper U6 station (click here for exact location on the brown line). 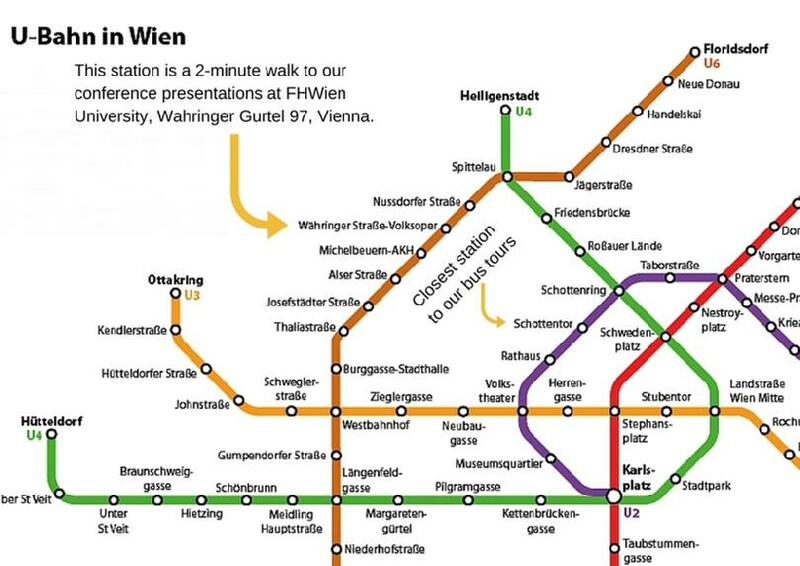 On the other hand, the University of Vienna (from where we will depart for the tours) is close to the Schottentor U2 station (click here for its location on the purple line). Once you come out of the Schottentor U2 station, you still have to walk about 4 minutes and go round the corner to see our private coaches! 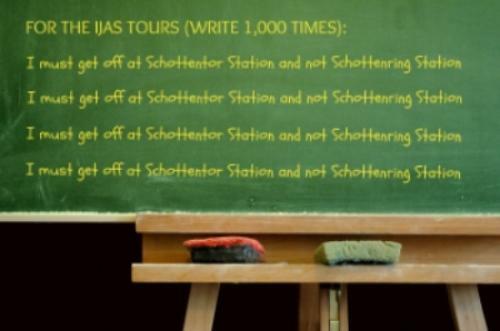 Why can't we depart for the tours from FHWien of Applied Sciences? you may wonder. Because it sits on a multi-lane highway with no parking space for the big tour buses. In seeking an alternative departure point, we sought a central location.